Imagine a scenario when you have a long-term job scheduled for weeks ahead with numerous field staff allocated, but for a day or two a staff member is having unexpected leave emergency, so you need to remove him from the personnel list for these particular two days, but still keep him available for the rest of the week days. 2. From the new interaction panel, click on the drop-down menu to select more than one calendar names for duplication. For this example we will duplicate just one entry. Confirm the selection by pressing the green Duplicate button on the right side. 3. 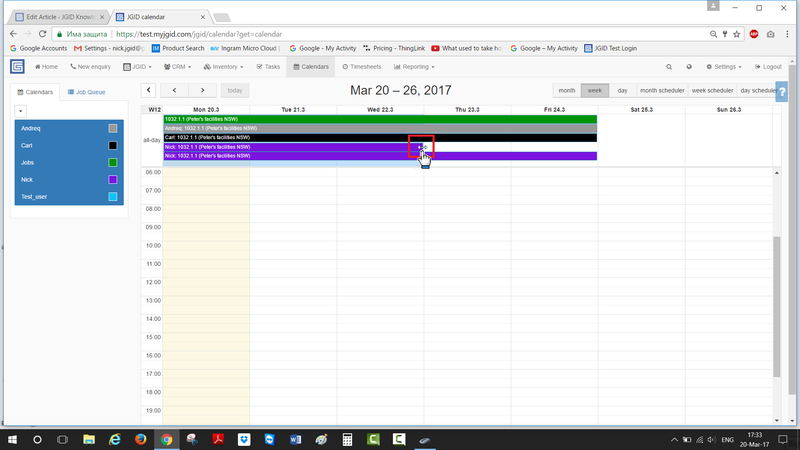 Shrink both of the Calendar instances for the [articular user and assign them to the desired time-frame of the week.